The Countess™ II FL Automated Cell Counter is a benchtop assay platform equipped with state-of-the-art optics, full autofocus, and image analysis software for rapid assessment of cells in suspension. With three-channel flexibility—brightfield and two optional fluorescence channels—researchers can count cells, monitor fluorescent protein expression, and measure cell viability. This Countess II FL Starter Package contains the Countess II FL Automated Cell Counter, two of the most popular EVOS™ light cubes (GFP and RFP), disposable and reusable slides to maximize convenience and minimize cost, as well as trypan blue stain. • Fast—counts live and dead cells and measures average cell size in as little as 10 seconds. Counting speed is virtually identical when using fluorescence. • Convenient—requires no cleaning or routine maintenance. A capacitive touchscreen and simple user interface provides quick startup and requires minimal training. The Countess II FL Automated Cell Counter uses trypan blue staining combined with an auto-focus mechanism and sophisticated image analysis algorithm to obtain accurate cell and viability counts. The measurement range extends from 1 × 104 to 1 × 107 cells/mL (the optimal range is 1 × 105 to 4 × 106 cells/mL), which is broader than that of a hemocytometer. The optimal cell size is 10–60 µm. 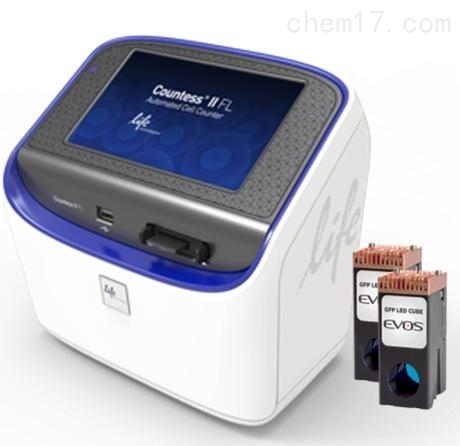 Operated using an intuitive user interface, automated cell counting with the Countess II FL instrument gives you the data you need to prepare your sample for the next passage or experiment, and allows you to multiplex with a variety of fluorescent dyes and proteins excited via EVOS light cubes.